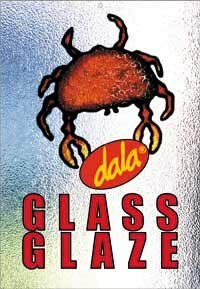 Dala Glass Glaze is a water-based paint, available in 15 colours and 15 Glass Liners. It achieves wonderful results, not only as the basis for window and tile decals, but also for window treatments and creating fridge magnets. The sea-life theme, as used in this project, works successfully in both the bathroom and the kitchen. Using you choice of Glass Liner, trace the design onto the acetate. Top tip: for successful lining, slice just the tip of the nozzle at a 45 degree angle. When squeezing the line out through the nozzel, the hole should always face you so that the line comes out not as a flat line but as a raised line. Once the liner has dried, colour the design in using a kebab stick. Never shake the paint before use. Simply stir with the rear end of a kebab stick. Use a paintbrush, as the bristles trap air and form bubbles. When applying the paint, always work around the lined area first. This forms a bond with the liner. Once having completed this, flood the remaining area with paint. I have added salt into the wet paint while painting the crab. This create an interesting effect. Top tip: For a successful finished product, the acetate must be kept level. If you don't do this, the paint will run to the lowest point and produce undesirable results. The decals may be removed and repositioned without having to reapply the glue. Paste the magnet onto the back, using epoxy glue. This item has 1558 views.